The global market for cellular health screening comprises a high level of competition with a large number of players operating in it, states a new market intelligence study by Transparency Market Research. The rising emphasis of the players on the advancements and innovations are projected to enhance the growth of the overall market in the next few years. In addition to this, the rising investment by the key players for the rapid development of the healthcare segment is another major factor that is likely to encourage the competitive environment of the market in the next few years. Furthermore, the rising number of collaborations and mergers and acquisitions is expected to offer growth opportunities in the coming years. Some of the key players operating in the cellular health screening market across the globe are Life Length S.L., Cell Science Systems Corporation, Laboratory Corporation of America Holdings, Genova Diagnostics Inc., Quest Diagnostics Incorporated, SpectraCell Laboratories Inc., Cleveland HeartLab Inc., and Bio-Reference Laboratories Inc. 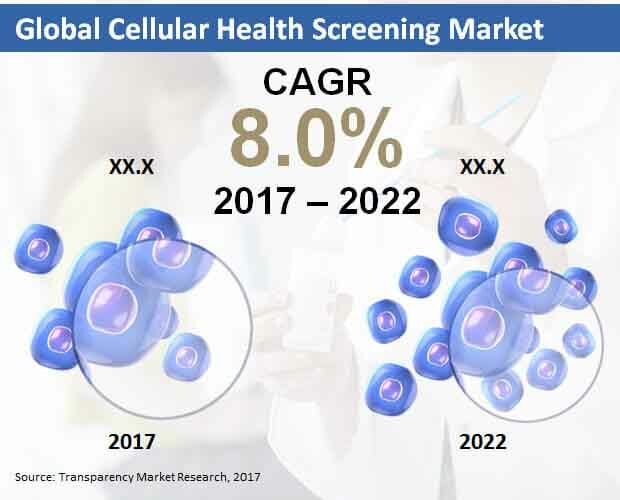 According to the market research study by Transparency Market Research, in 2016, the global market for cellular health screening was worth US$ 2.1 bn and is projected to reach a value of US$ 3.1 bn by the end of 2022. The market is predicted to register a healthy 8.0% CAGR between 2017 and 2022. Among the key regional segments, North America is expected to account for major share of the global cellular health screening market in the next few years and is projected to remain dominant across the globe. The strong growth of the healthcare sector is the key factor encouraging the growth of this region in the last few years. Furthermore, Europe is projected to witness high growth in the market and is likely to register a promising growth rate in the coming few years. On the other hand, Asia Pacific is estimated to grow at a healthy rate, thanks to the rising demand from developing economies. Moreover, the rising investments in the healthcare sector in these nations is projected to support the growth of the overall market throughout the forecast period. On the basis of test type, the global market for cellular health screening has been categorized into oxidative stress tests, telomere tests, inflammation tests, multi-test panels, and heavy metal tests. Among these, the telomere tests segment is projected to lead with a major share of the global market in the next few years. According to the research study, this segment is projected to register a healthy 8.40% CAGR between 2017 and 2022. The high growth of this segment can be attributed to the fact that these tests are considered vital in terms of understanding the effects of aging on an individual. The rising adoption of telomere performance programs in order to lead a healthy life is one of the major factors that is projected to encourage the growth of the global cellular health screening market in the next few years. The increasing government focus on preventive healthcare and the rising geriatric population are further projected to enhance the growth of the market in the near future. On the flip side, the concerns related to the transport of samples and the limited reimbursement are projected to restrict the growth of the market throughout the forecast period. Nevertheless, the rising adoption of digital technologies for testing and the rising number of research and development activities are estimated to generate potential growth opportunities for the market players in the next few years. The rising awareness among consumers related to the importance of a healthy lifestyle is one of the major factors encouraging the growth of the global cellular health screening market in the next few years. Rising government focus and the increasing adoption of digital technologies to accelerate the growth of the market in the coming years.